Online applications are invited from women candidates for admission into 1st year B.A/B.Com/B.Sc Degree English Medium Courses (40 students in each course) in TSW Residential Degree Colleges for Women for the Academic Year 2018-19. Students who have passed in Intermediate Annual Examinations in 2018 or 2017 conducted by the Board of Intermediate Education of Telangana State or its equivalent and who secured 40% or more marks are eligible to apply for admission. Candidates whose annual income of the parents is more than Rs.2.00 lakhs in Urban areas and Rs.1.50 lakhs in Rural areas are not eligible for admission into 1st Degree Courses. Applying for admission does not confer any right for admission. Applicants shall also fulfil other admission criteria stipulated by TSWREI Society, Hyderabad. The Society reserves the right to change the rules of admissions as per the directions of the Government and University from time to time. 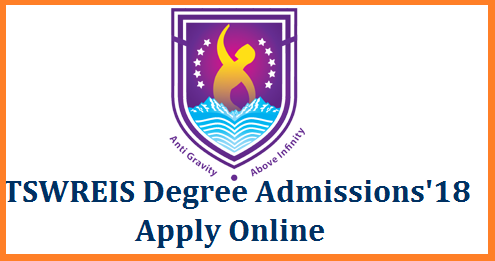 The candidate shall first go through the prospectus carefully, available in the website and satisfy herself with the eligibility criteria for appearing for admission. The candidate shall follow the procedure for submission of online application as given in the prospectus and also as per the instructions provided online while filling up the online application form. On submission of application online, the candidate has to take a copy (print) of the acknowledgement in which a reference number also will be given, it is to be preserved for further reference. The candidate is solely held responsible for any mistakes / incorrect information given by her. Hence they must take utmost care while filling the online application. The applications of the ineligible candidates will be rejected.